There's no time like the present to start preparing your body for pregnancy. Whether this is your first time up at bat or you're hoping to conceive your second or subsequent baby, there's plenty you and your partner can do right now to increase your odds of giving birth to a healthy baby. Writer Ann Douglas, author of many books including The Unofficial Guide to Having A Baby, has some answers to the preconception-health related questions that are likely running through your head right about now. I've heard a lot about the benefits of taking folic acid before you start trying to conceive. How much do I need to take and how soon do I need to start taking it? Most preconception health authorities recommend that women who are planning a pregnancy take 0.4 mg of folic acid daily for two to three months before becoming pregnant and for the first four weeks after conception. Other health authorities take things one step further, recommending that a woman take folic acid throughout her childbearing years, whether or not she is consciously planning a pregnancy. Note: If you have a family history of neural tube defects, you've previously given birth to a baby with a neural tube defect, or you are taking certain medications to control diabetes or epilepsy, you will require a higher-than-average dosage of folic acid. Your doctor or midwife will be able to make specific recommendations, based on your medical history. A generation ago, your doctor would have thought you were crazy for trying to set up a checkup before you were pregnant. Today, it's fast becoming the norm. The reason is obvious: the most critical period in your baby's development occurs before you even know that you're pregnant. Whether your immunizations are up to date (it's particularly important to ensure that you're immune to both rubella and chickenpox). Whether any pre-existing health conditions (e.g. diabetes or high blood pressure) are likely to have an impact on your pregnancy and, if so, what can be done to manage these conditions. Whether your gynecological or obstetrical history puts you at risk of experiencing any fertility or pregnancy-related complications. Whether it's safe for you to continue taking any prescription or over-the-counter drug products that you're currently using, or whether it would be best for you to switch to a more baby-friendly medication once you start trying to conceive. Whether it's safe for you to continue using certain types of herbal products while you're trying to conceive. 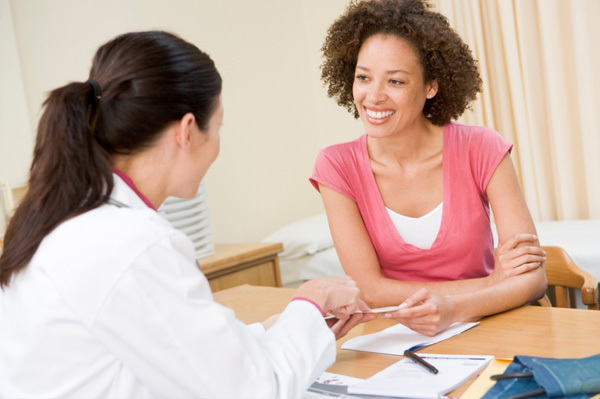 Whether you and your partner are good candidates for genetic counseling. I'm about 10 pounds heavier than I should be. How important is it that I get to a healthy weight before I start trying to conceive? Contrary to popular belief, you don't have to have the body of a supermodel in order to get pregnant. In fact, it's probably best if you've got a little more padding than that. You see, if your body fat percentage drops below a certain level, you stop ovulating. That's not to say that you want to be overly plump when you embark on a pregnancy, however: studies have shown that obese women face a higher-than-average risk of experiencing certain types of fertility problems and pregnancy-related complications. If you do need to shed a few pounds, go at it sensibly and slowly. Crash dieting can cause your body to stop ovulating temporarily and deplete your body of its nutrient stores -- the last things you want when you're planning a pregnancy. At what point should I quit smoking and drinking? Because smoking has been shown to contribute to fertility problems as well as pregnancy-related complications and complications in the newborn, there's no time like the present to kick that particular habit. And as for drinking, most health experts agree that you should plan to give up alcoholic beverages as soon as you start trying to conceive. How important is it for me to kick my coffee addiction? The jury's still out on the impact of moderate caffeine consumption during pregnancy. Some studies have shown a link between moderate caffeine consumption and an increased risk of miscarriage, while other studies have failed to demonstrate the same connection. Rather than sentencing yourself to nine months of worrying about the effects of your morning java on your baby-to-be, why not kick your caffeine habit now? That'll leave you with one less thing on your worry list. Is it safe for me to continue exercising while we're trying to conceive? It's generally safe to continue exercising when you're trying to conceive. Just make sure that your workout is moderate in intensity and that you don't allow your core body temperature to rise too high. If you're concerned that your usual workout regime may prove too rigorous once you become pregnant, talk to your doctor or midwife about your concerns before you start trying to conceive. Where does my partner fit into the whole preconception health picture? Does he need to think about making some lifestyle changes as well? Preconception health planning is definitely a team sport! Your partner should also take steps to improve his own health: he should get to a healthy weight, if he's obese (overweight men are more likely to experience fertility problems than normal-weight men); check with his doctor about the advisability of continuing to take any herbal products and medications while the two of you are trying to conceive; quit smoking (it could impair his fertility and, besides, second-hand smoke isn't good for you or your baby-to-be); and avoid activities that lead to overheating of the scrotum (e.g. hot baths) or injury to the groin area (excessive cycling). While there's nothing you can do to guarantee that you'll win at baby roulette and end up with a healthy baby nine months down the road, there's plenty you can do to tilt the wheel in your favor. Don't you owe it to yourselves and your baby-to-be to do just that?